REGISTERED voters in Negros Oriental for the May 13 national and local elections are advised to double check their names in the Certified Voters’ Lists of the Commission on Elections (Comelec) in the town or city where they are registered and find their assigned precincts to avoid confusion on election day. 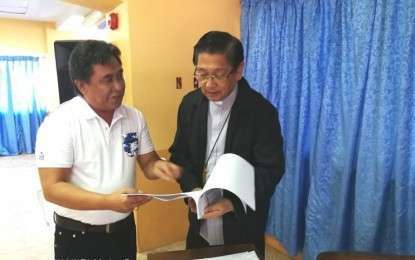 Provincial Election Supervisor lawyer Eliseo Labaria on Tuesday, February 19, gave the advice as he handed a copy of the official list of voters from different municipalities and cities to Bishop Julito Cortes, who sits as honorary chair of the Diocesan Electoral Board (DEB) of the Diocese of Dumaguete during the regular meeting of the Dumaguete clergy. The Diocesan Electoral Board is a citizens' arm of the Comelec, comprising church, government and non-government officials, agencies, organizations, and groups sharing the same goal of Clean, Honest, Accurate, Meaningful, and Peaceful elections. Labaria was a guest speaker during the meeting where he spoke about election concerns. The voters’ lists will be posted by in the different Comelec offices and in the barangay halls, Labaria said. Meanwhile, Msgr. Julius Perpetuo Heruela, lead convenor of the DEB, also said they will make available the lists to the parishes which shall assist voters in the verification of their voting precincts. The Comelec also gave a “soft copy” to Msgr. Heruela. 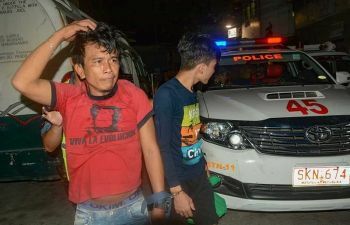 The Posted Computerized Voters’ List will be placed on the doors of the classrooms at the schools where the voting will be held, he said in the Cebuano dialect. Records at the provincial Comelec office show that Negros Oriental has a total of 888,826 registered voters in the province’s 557 barangays. According to Labaria, there is a big chance that some voters may have been transferred to a different precinct considering that this time, each precinct has 1,000 voters assigned compared to 800 voters only in the 2016 elections. Negros Oriental has a total of 1,191 clustered or group precincts.